Many trails in the Uinta Mountains have few, if any, signs. The sign above indicates where the trail is supposed to go, but following a trail is sometimes problematic. When a trail is invisible, there are occasional cairns, usually 2-3 rocks on top of each other, not huge ones like this. Perhaps the boy scouts needed a project? Daisy had a fantastic time running in the high meadows. The creek has lovely cascades. The DWR (Utah Department of Wildlife Resources) elecroshocked Reader Creek a few years ago to remove the non-native brook trout. Supposedly they have replaced the brookies with native cutthroats, but we didn't see many fish of any kind. We took a break at one of the many lakes in the high meadows above Reader Creek. The meadow near the creek and lakes has a six inch cushion of spongy growth. Stepping on it is like walking on air. I suspect there is a botanical term for this kind of growth, but I don't know it. Dark clouds moved in by early afternoon, which kept the hike cool. We walked 7 miles with no raindrops, enjoying a fantastic alpine day. To view more skies of every variety, click here. The bees arrived at the post office freight department in a screened box. 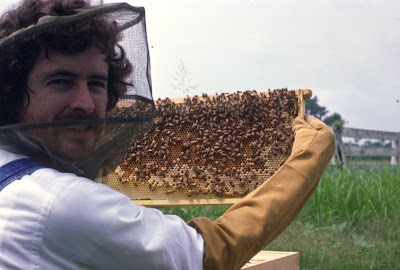 Steve was unavailable at the time, so it was Janie who balanced that box, surrounded by outside bees attracted to the queen inside. Janie blustered (barely) on home with the interesting baggage. Steve was bold with his first batch. He bluffed the bees into submission. Later, he learned to use smoke to make their behavior bland. We boasted many buckets and bottles of honey. Later, the bairns got into the act. 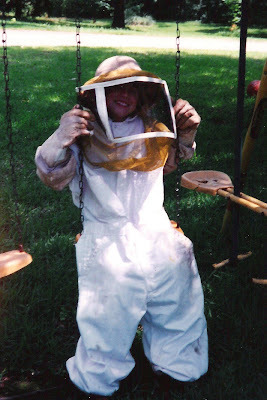 They all wore bodacious bee suits. 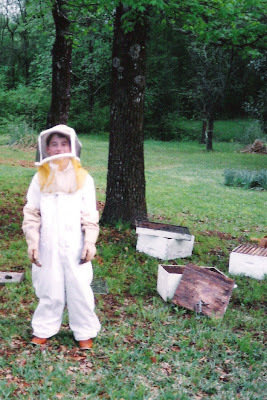 Even the itsy-bitsiest, who remained in the background, sported the beekeeper fashion. 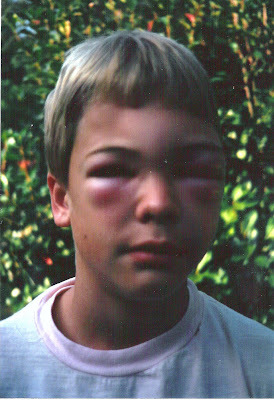 One bairn became overly brave (approached a hive with no suit), and was battered by a bee sting in the face. The blemish was bizarre. But temporary. Now, we have no bees in boxes. Instead, we watch the wild and free bumble bees bustle busily and burrow into beautiful blooms. Bzzz. Most lupine are blue, but sometimes a few white plants stand out in a group. We see a lot of Indian paintbrush in pink or red. But this closely related sulphur paintbrush is white. Wild columbines in norther Utah are usually white. 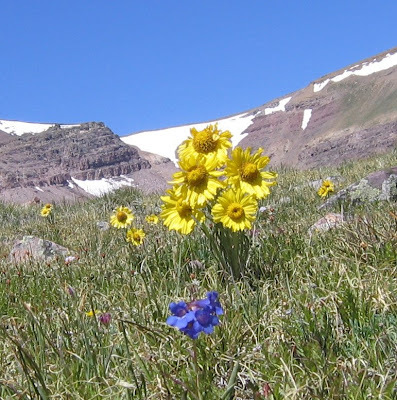 But some have a tinge of the violet petals more commonly seen in Colorado. Sego lily, the state flower of Utah, is almost always white. But this year, we saw a few in this startling hot pink shade. Nature is always new, always surprising, and endlessly fascinating. For more views of fascinating worlds, click here. Janie: "No, Daisy, I can't come down and play with you right now. Maybe we can find a nice horse trough for you to swim in." Daisy: "Success! Now if I can just locate a rabbit to chase." 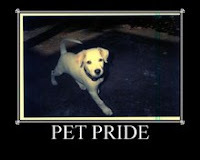 To view more proud pets, click here. Daisy: "Oh, you're taking a nap on the trail? I'll help. But if you'd rather play, I'm with you." For more cute, interesting critters, click here. to the sky, it seems. A change of elevation and angle shows that there really is an earthly path, which only proves the importance of perspective! From my seat on Mishief's back, I took a photo of Steve taking a photo from Boss's back. This makes for a whole lotta movin' and shakin' going on (are you humming the Jerry Lee Lewis tune?) when the horses are stamping at flies or trying to munch some grass. We snapped plenty of pics, some from in the saddle, some from the ground. Wild roses, penstemon, and forget-me-nots were also in bloom, along with some kind of currant or gooseberry. The horses had a chance to taste the tall grass before it was time to follow the sky home. For lovely views of skies all over the world, click here. 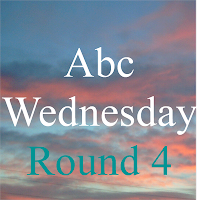 A is for Alpine, where the ambiance achieves an amazing allure. An ascent to the apex requires becoming acclimated to the altitude and adapted to the thin air, but if you have access to mountains, I advocate that you embrace the adventure. I adore the views from such an angle. The air is like ambrosia, filled with scents of arnica and aster, lupine, geranium, and buttercup, sometimes around aspen. Ambling along , one may be all alone, aloof from the cares of the world below. The view is so all-encompassing that it seems an apparition. Absorb the abundant beauty, act in accord with nature, and be accompanied only by angels and airplanes. I assure you that you will acquire an assiduous addiction. You can seek answers to anguish, alter an attitude, adopt the sky as your own, or advance an ambitious agenda of aerobic exercise. May such beauty remain unaltered, always available when mankind aches for the Almighty's artistry. If you like seeing so many wildflowers that your camera trigger finger wears out and your eyes experience color fatigue, visit the vast area north of Strawberry Reservoir in mid-July. We drove over last Thursday (about an hour and a half trip from home) and stayed overnight so we could ride the trails two days in a row. The horses had ample grass available at our campsite. Even there, the flowers had taken over the old two-track and fire pit. Steve uses a single hobble to tie Boss to a drag log durinig grazing time. That way, Boss can move around but won't go far. Mischief just wanders nearby. He won't leave his more dominant friend. Both wear big cowbells so we can locate them easily if they meander out of sight. At night, we tie both horses to a high line while we sleep in our gooseneck trailer, so that we can be confident they'll still be there in the morning. (Ever heard the old saying, "Good judgment comes from bad experience"? Yes, we learned to take all of these precautions due to a little mishap that led to the horses having a 3 week unsupervised vacation in the mountains back in 2006. But that's a tale for another day.) From a trailhead at 8200 feet(2500 m) to the summit of our rides at 10,400 feet (3200 m) in altitude, the variety and sheer volume of wildflowers were amazing. This trough, supplied by a natural spring, was put there by ranchers who hold a cattle grazing allottment on the mountain. Daisy and the horses were pleased to take advantage of it. The trough is surrounded by wildflowers, gooseberry bushes and a lovely woods for shade. Above are views to the west toward the Wasatch Range. This photo looks to the south, showing Strawberry Reservoir in the distance. Different wildflowers will be blooming in August, and in late September, the aspens will turn gold. "Lord willing and the creek don't rise" (as the old saying goes), we shall return!